Your Rights as a Voter - Community Legal Aid Society, Inc.
Voting is a way to make your voice heard and for you to express your opinions, and to influence who is making those important laws and policies. If you do not vote, you are letting others make decisions without you getting a say in what they decide. People with disabilities tend to have more contact with the law than those without disabilities, whether it is because they may need the protections of anti-discrimination laws or public benefits for people with disabilities (like Social Security Disability, SSI, or Medicaid). This means that people with disabilities have even more reasons to participate in the voting process! Across the country, people with disabilities have often not cast their ballots – because polling places are not accessible, because of discriminatory practices, because they (wrongly) think they cannot vote because of their disability, or because they do not think their vote will make a difference. Unfortunately, many polling places are still inaccessible. The Government Accountability Office estimated (based on data from the 2008 federal election) that 27 percent of polling places have potential accessibility issues and do not even offer curbside voting to address this (http://www.gao.gov/products/GAO-13-538SP). Contact the Disabilities Law Program if you have problems accessing your polling site by calling (302) 575-0660 or 1-800-292-7980! Even in recent elections, people with disabilities vote at lower rates. According to a study of the 2012 elections, people with disabilities voted at a rate that was 5.7 percentage points lower than that of people without disabilities (Schur et al. (Rutgers RAAV team), Disability, Voter Turnout, and Voting Difficulties in the 2012 Elections, (July 18, 2013), available at http://www.accessiblevoting.org/). This means that if people with disabilities voted at the same rate as people without disabilities there would be 3 MILLION more voters with disabilities(Schur et al.)! Imagine what a difference 3 million people can make – and remember that when it is time to register to vote and to cast your ballot! Let’s change the low voter turnout of people with disabilities! Go to ivote.de.gov to register to vote or check your registration status, find your polling place, request an absentee ballot and more! In an effort to remedy the problems of inaccessible polling places and problematic polling practices, protection and advocacy agencies such as the Disabilities Law Program have set out to educate and advocate the public to ensure that people with disabilities share one of the most fundamental rights of our country: the right to vote. The Disabilities Law Program receives funding to assist in the implementation of the Help America Vote Act and to ensure the full participation of people with disabilities in the electoral (voting) process. The DLP can provide education, training and assistance to people with disabilities to promote their participation in elections, including voter registration, training and advocacy informing the community about their rights on Election Day, including the right to accessible polling places. 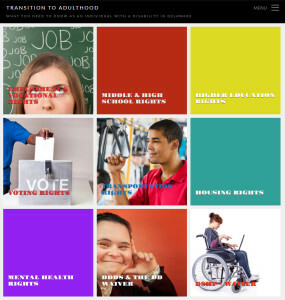 For even more detailed information, visit http://transition.declasi.org/voting-rights/ (contains a detailed guide to voting rights, geared toward transition age youth with disabilities)! New Federal Guidance! The U.S. Department of Justice has published a new technical assistance publication about federal laws that protect the rights of voters with disabilities, including the Americans with Disabilities Act (ADA), the Voting Rights Act, the National Voter Registration Act and the Help America Vote Act. The publication, “The Americans with Disabilities Act & Other Federal Laws Protecting the Rights of Voters with Disabilities,” is intended to help election officials, poll workers and voters understand how the ADA and other federal laws ensure equality in the voting process for people with disabilities. The publication is available in HTML and PDF versions on ADA.gov.